I went swimming with some friends (floating while being guided by the non-existent wave in the pool). Found a perfect companion for it called beer. Is beer really good for your kidneys? Our taxi driver in Goa told us that it is. My Doctor friend said No but Google disagrees. But, then again Google gives you whichever answer you want to find. On my way home, I crashed my sister and brother-in-law's romantic Sunday lunch at Salt Water Cafe to grab some dessert - dark chocolate crème brûlée. And washed it down with green tea. I don't know if green tea washes down anything. But it did wash away some of the guilt of over-eating. Came home and felt a little guilty about crashing their lunch till I looked at myself in the mirror and saw how they hadn't told me that my after-swim-undried hair looked like a mop on my head. I was about to take a nap and my friend popped by. To talk about life. And I forced her to take a nap too. She turned out to be a true friend for about 30 minutes. After which she kept poking me to wake me up so she could grab a bite somewhere. 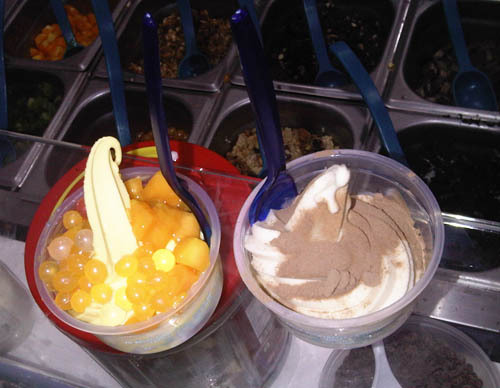 While she got her Shawerma at Maroosh, I got some Frozen yoghurt at Yogurtbay on Carter Road. You have to try the Blueberry Cheesecake flavour. It's just everything you want it to be. Lovely blueberry topping and crumbly cheesecake base sprinkles. Do check out the website. It's nice and friendly and even has pointless sections like Everybelly. Interesting! 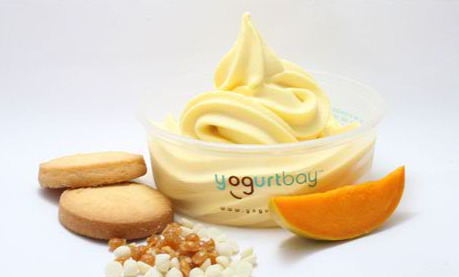 picture from the yogurtbay website. Tip: Please don't ever go to Cocoberry. It smells funny and tastes bleaaaheaahhh (that's an exaggerated blah). I ate some more yoghurt again for dinner while watching Simi's new show. Could she be more annoying while flirting with India's Most Desirable? Siddhartha Mallya was cute even with all the twitches. He made me want to speak with my British accent during the commercial breaks to everyone sitting around me. I pretty much just said uhf-khos (ofcourse) to every question. swimming = pain in my feet. even my toes. And in the middle of it all, I made my sister play photographer and help me shoot for future Sunday thank-yous. It was a blast. I don't know if she agrees. I wanted to give you a sneek peek but then thought why not just wait till Sunday. Update (1 week later): Also try the Mango flavour, topped with real mango pieces and a colourful water-balloon-like topping that feels like Holi in your mouth. And the Tiramisu flavour. Now I'm not a fan of Tiramisu or anything coffee-like but it's to die for.